Following a stormy session, the council took no action on the Israeli request, though several members sided with Israel and expressed concerns over Hezbollah’s violation of a U.N. Security Council resolution that ended a 2006 war between the bitter enemies. Israel has previously urged the U.N.’s most powerful body to condemn Hezbollah, but has never succeeded because of divisions in the council, and there was no move Wednesday to circulate a draft resolution on the tunnels. A key reason for the lack of council action is that some members would insist that Israeli violations of the 2006 resolution also be included in a resolution. Ahead of Wednesday’s debate, Prime Minister Benjamin Netanyahu urged the council to condemn Hezbollah. At the United Nations, Israeli Ambassador Danny Danon showed an aerial photograph of what Israel called a “private compound” near the border that concealed a tunnel. He also presented an aerial photo showing what he said were weapons-storage sites concealed in a border village. He said Israel had given the U.N. peacekeeping mission, known as UNIFIL, “precise information” about the tunnels that was shared with the Lebanese army. He accused the Lebanese army of then relaying the information to Hezbollah, allowing it to try to conceal the tunnels. “Lebanese army officials are working for Hezbollah, while UNIFIL is not working to fulfill its mandate in the region in the necessary manner,” Danon said. The U.N.’s peacekeeping chief, Jean-Pierre Lacroix, said UNIFIL had confirmed four tunnels, including two that cross the frontier into Israel. Calling them a “serious violation” of the 2006 cease-fire resolution, Lacroix said UNIFIL is “acting judiciously” to complete its investigation and to work with both sides to disable all tunnels that cross the border. “This is a matter of serious concern,” he said. Lebanon’s ambassador, Amal Mudallali, said her country took the matter seriously and remains committed to the cease-fire resolution. “This commitment is not rhetoric, and these are not mere words, because this commitment is in the interest of my country and my people,” she said, adding that the Lebanese army is “deployed heavily” in the south to make sure the cease-fire is honored. But she also accused Israel of repeatedly violating the resolution by having its air force routinely fly through Lebanese skies. “If we were to call for a Security Council meeting every time Israel had violated Lebanon’s sovereignty since 2006, you will be in a 24/7 shift to address them,” she said. Several council members joined Israel in condemning the tunnels. Sweden said Hezbollah’s military capabilities pose a “clear risk” to regional stability. The Netherlands strongly condemned the tunnel activities as a “flagrant violation” of Israeli sovereignty and international law. Safronkov said Russia takes note of UNIFIL’s preliminary conclusion on the violation of the 2006 resolution over the tunnels. But he quickly referred to Israeli violations as well. He said Israel has a right to prevent illegal incursions into its territory but expressed hope its activities “will not go against the grain” of the 2006 resolution. Israel has long called for a crackdown on the Iranian-backed Hezbollah, a heavily armed mini-army that is believed to possess an arsenal of some 150,000 rockets that can reach nearly all of Israel. In recent years, Hezbollah has been bogged down in fighting in Syria on behalf of Syrian President Bashar Assad’s government. But with that civil war winding down, Israeli security officials fear Hezbollah is refocusing its attention on Israel. 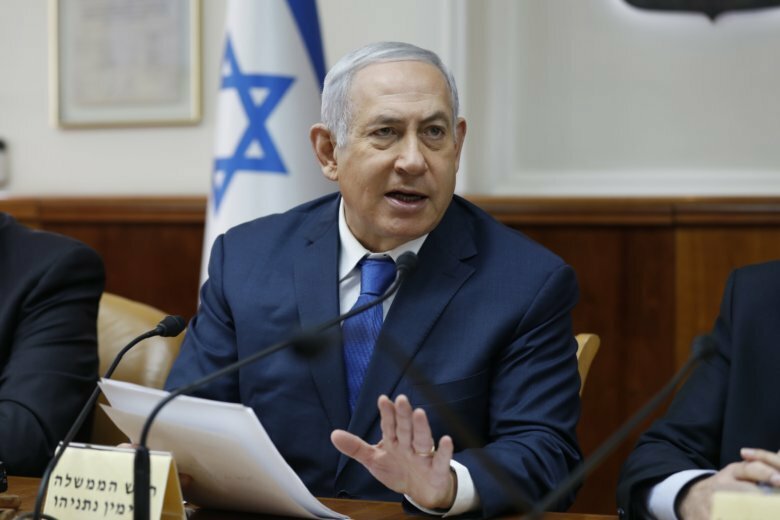 Though it appeared the Lebanese army was unaware of the Hezbollah tunnels, Netanyahu said, they know about it now and must neutralize them for their own country’s sake. Israel holds the Lebanese government responsible for the actions of Hezbollah. Israel also accuses Hezbollah of using private homes to store weapons or other military activity. Netanyahu called these actions a “double war crime” since it threatened to harm Israeli civilians and put Lebanese civilians in danger as well. Hezbollah, Lebanese and Palestinian flags fluttered on the opposite side of the border as Israeli soldiers lowered cameras 26 meters (85 feet) into the mouth of a rock-hewn tunnel they said was the first exposed in “Operation Northern Shield” emanating from the Lebanese village of Kafr Kela just a few hundred meters (yards) away.